"The Letter Scene was a tour-de-force, Boulianne using a palette of varied hues." 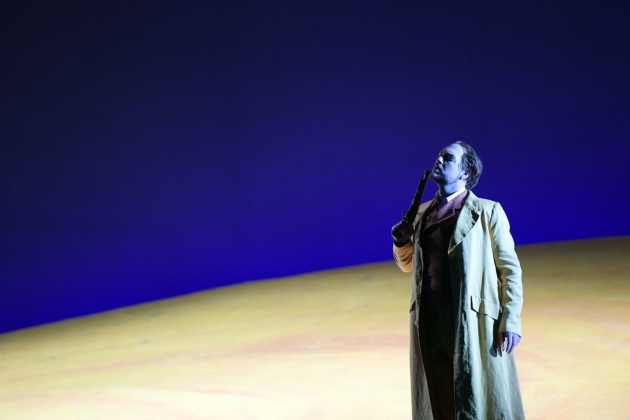 Massenet’s Werther (seen at Oper Frankfurt on Dec. 30, 2017), based on Goethe’s epistolary novel The Sorrows of Young Werther written in Wetzlar near the author’s native Frankfurt, is one of those timeless operas which has enriched the coffers of opera houses the world over for well over a century. Much of the opera’s success can be attributed to pages upon pages of beautiful music, though one could argue that the protagonist’s Act IV death scene goes on for far too long. 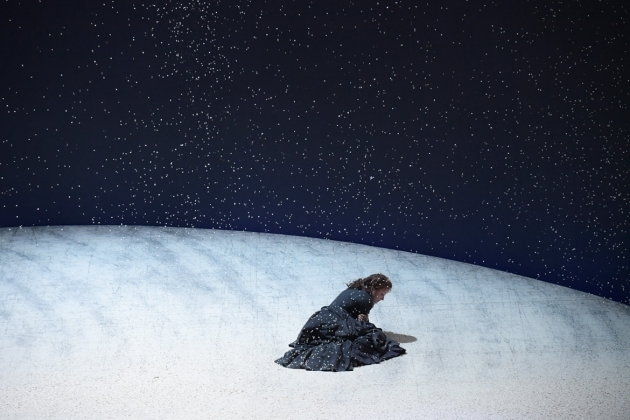 Timely it was that Oper Frankfurt revived Willy Decker’s staging of Werther this past December, considering that the opera’s climactic moments occur on Christmas Eve. Decker’s production, seen at its 30th performance at this house, also had a timeless quality, though not always in the best sense of the word. According to the score, the action takes place “between July and December,” a point that Decker and his set and costume designer Wolfgang Gussmann ignored. Either that or they felt that the weather in Werther’s Wetzlar ought to be the same in summer as in winter since none of the characters wore anything but period dress suitable for winter. Perhaps those one or two snowflakes which occasionally floated down from the gantry prior to the Act IV Christmas Eve snowstorm weren’t so stray after all. Joachim Klein’s lighting did help differentiate the seasons by establishing the opening act’s summer season with its sunny, yellow light, and the darkness of the final act’s winter night with ominous shadows being cast about. Further in the deuxième tableau of Act IV, neither Werther nor his costume showed any signs of a fatal pistol shot, the character even rising from a prone position to walk about extensively while singing before finally succumbing to his invisible wound. 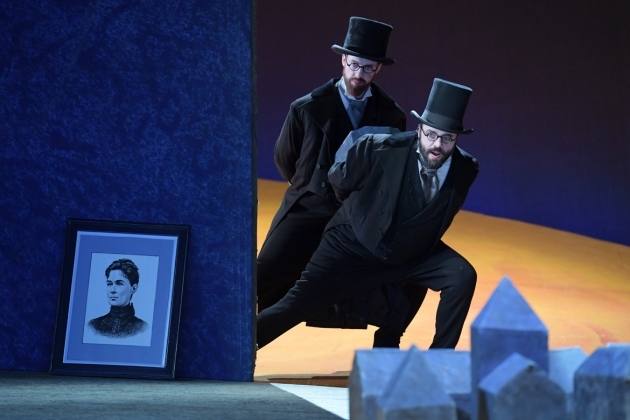 Alas, Decker gave away the opera’s ending when he had Werther stand with his back to the audience and a pistol to his head in a clichéd pantomime which played out during the first bars of the Act I Prélude. Decker also had Acts 1 and 2, then 3 and 4 play without break which deprived the Frankfurter Opern- und Museumorchester of much needed opportunities to re-tune. As for set design, this was a minimal Werther. A raked stage with a sliding, perpendicular divider wall, chairs, tables, a painted portrait of Charlotte’s late mother, Christmas carol sheet music for Charlotte’s seven younger siblings, Styrofoam miniature buildings and a pistol were all the trappings Gussmann provided. 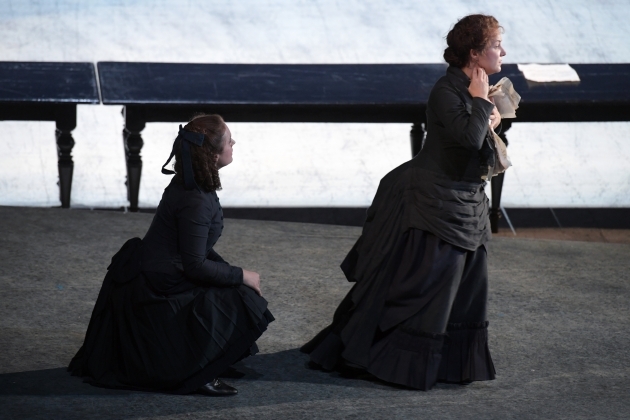 Attilio Glaser was a convincing Werther, but vigorously pushed out high notes such as the A on the word “ciel” in Act I.
Canadian mezzo-soprano Julie Boulianne’s plummy tones and impeccable French made her a memorable Charlotte. The Letter Scene was a tour-de-force, Boulianne using a palette of varied hues. Bass-baritone Franz Mayer sang an impeccable Le Baïlli with a firm vocal tone. Sebastian Geyer’s brooding Albert added a weightiness to his scenes. Louise Alder was a suitably pert Sophie who could produce ringing high notes such as the high A on “heureux” in “Du gai soleil,” eight bars after having sung “que Dieu permet d’être heureux” with hushed, straight tone. Constantin Neiconi as Bruehlmann, Jianhua Zhu as Kaethchen, as well as their colleagues in the Chor der Oper Frankfurt as the townsfolk had no difficulty with their roles.